Ghosting is one of the oldest and most annoying TV picture impairment problem, frustrating Cable TV overbuilders as well as established cable operators. For the new wave of overbuilders the accent is on high-speed internet and local/long distance telephone service. Consequently, they want to position the Central Office in the Downtown area, to be co-located with the Cable TV head-end, small earth station and over-the-air TV reception facilities. Sooner or later they must discover that tall downtown structures interfere with TV reception, producing reflections (ghost-ing). Here are their options: import the pictures by fiber from the TV studios (expensive). Search for a new, ghost-free location (signal survey). Hire professional engineers with ghost-reduction experience (Biro Engineering). None of it? You don't want to antagonize your new subscribers with inferior picture quality. In the past certain established cable operators could get away with less than perfect over-the-air TV pic-tures. There was no competition. Overbuilders changed the equation. These days residents have a choice in cable subscription charges, high-speed data, and telephone service, as well as picture quality. In a rough and tumble broadband marketplace the customer is king. Occasionally they take a critical look about pic-ture quality and change cable providers. Conclusion: The garbage-in, garbage-out syndrome still applies to overbuilders as well as to established operators. To learn more about ghost elimination techniques turn to the next pages. The pictures above present the polar (on the left) and the rectangular (on the right) radiation patterns of the single, six-element Yagi, tuned to Channel 8. Observe the relatively wide main lobe in the front, as well as the less than spectacular Front/Back ratio. In between there is a 55° wide range of 25 dB protection. By forming a two-bay, horizontally stacked array of these dual-drive, 6 element Yagis, ghost rejection con-ditions will change (improve) dramatically, as shown on the two radiation patterns below. The graph on the left displays the case of H = .96 l horizontal spacing, while the radiation characteristic on the right documents significant improvements with shrinking the horizontal spacing to H = 0.72 l.
The main lobe's beamwidth narrowed from 58° between -5 dB points to 32° between the -5 dB points. Applying 0.96l horizontal spacing, the 25 dB protection level widened from 55 ° to 100°. With H = 0.72l separation 30 dB uninterrupted protection was obtained for a 110° wide side-angle. A spectacular improvement. Leading antenna manufacturers recommend 0.95 to 1.05l horizontal spacing and call it optimum. Biro Engineering holds on to our choice of H = 0.69 to H = .75 wavelength, based on unbiased radiation pattern analysis and many years of field experience. Is there any chance for further improvement? The answer is affirmative. Apply a higher gain, higher di-rectivity Yagi , and the test-results will please the CATV engineer. The pictures above show the polar and rectangular radiation patterns of a 9 element, dual-drive Channel 8 Yagi, exhibiting a narrower main lobe, accompanied by 17 dB down first side lobes, and dramatically im-proved Front/Back ratio. Turning to the graphs below, the left plot shows the results of the two-bay, horizontally stacked array of 9 element Yagis, with H = 0.72l spacing. Observe the single narrow main lobe. The 30 dB protection range became practically 140° wide, enhanced by 35 dB rejection in the 70° to 180° range. The Front/Back ratio became a solid 37 dB value. On the negative side of the ledger: instead of the theoretical 3 dB increase in antenna gain, this array will deliver only 1.4 dB additional gain. A small price for superb ghosting and electrical (AC) interference re-jection. To demonstrate the protection capability of the correctly designed two-bay, horizontally stacked ar-ray, the radiation pattern of the single antenna was shown again. Compare the pictures, observe the deeper and wider nulls. Is there any chance for further improvement? The answer is affirmative. 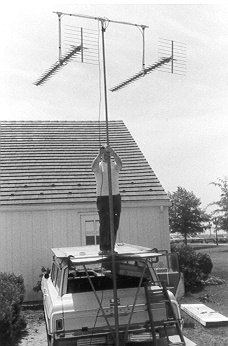 Apply a higher gain, higher directivity Yagi , and the test-results will please the CATV engineer.